Planted Eucalyptus forests occupy more than 18 million hectares globally and have become the most widely planted hardwood tree in the world, supplying high quality woody biomass for several industrial applications. This chapter attempts to link current eucalypt breeding practice and the genomic tools available or in development. A brief introduction is presented on the main features of modern eucalypt breeding and clonal forestry to provide a better understanding of the challenges and opportunities that lie ahead. Some current low technological input applications of molecular markers in support of operational breeding and clonal deployment are introduced. After reviewing the status of QTL mapping and gene discovery by EST sequencing, the prospects for physical mapping and association genetics in Eucalyptus are discussed. 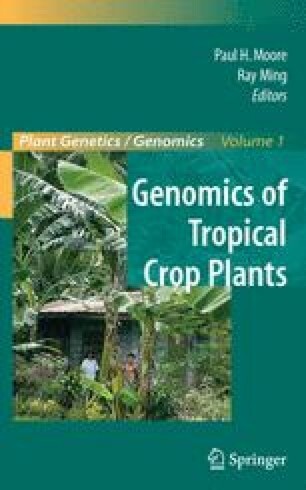 Challenges and opportunities for the application of genomic information to improve relevant traits are described within the framework of molecular breeding for trait improvement. Finally, with the expectation of a draft of a Eucalyptus grandis genome within the next three years, a discussion is included on the prospects of gene identification and subsequent applications in breeding.